Paul James followed the Ospreys in to regional rugby in 2003 and won his first international cap the same year when he started Wales' 54-8 win over Romania at the Racecourse Ground in Wrexham. His next international call came in 2009, when he was included in the Wales squad to tour North America. He failed to feature in Tests against Canada and the USA, but was a shock call-up to the Wales starting line-up to face New Zealand at the Millennium Stadium in November 2009. He went on to play all four of Wales' November Tests including victories over Samoa and Argentina, returning to domestic duty after their heavy defeat to Australia and scoring a brace against the Scarlets on Boxing Day. 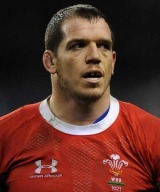 James kept his place in the Wales set-up under Warren Gatland and played a key role in their 2011 World Cup campaign. Although the campaign ended in failure - with France knocking them out in the semi-finals - James saw his stock rise after a series of impressive performances. Come the 2012 Six Nations, with doubts surrounding Gethin Jenkins' fitness, James looked set to play a key part in their campaign. But the Cardiff man recovered from injury and James' role in their Grand Slam-winning campaign was reduced to three appearances from the bench. In 2004 James was forced to undergo back surgery, keeping him out of the game for four months. In Ospreys colours he has won the Magners League and Anglo-Welsh Cup and also took the captain's armband when the region defeated Australia in 2006. But in May 2012, James opted to swap the Ospreys for Aviva Premiership side Bath where he put pen to paper on a two-year-deal.